Years ago, we traveled Mexico quite a bit. We spent four months total, starting on the Caribbean side and working our way down, to Belize, Honduras and Guatemala, then coming back up the Pacific side, before we flew back to where we started. It was an incredible trip, living out of our backpacks, staying in cheap hostels and filling up on street tacos, with less fear of getting sick and more relief of not having gotten sick. Back then, we'd stock up on tajin and bring it home. That was before our grocery store carried the small bottles, before Costco had it in bulk and before Amazon had everything. We'd cherish that little bottle and use it sparingly, on popcorn, tacos, salsa and more. Once we discovered it in bulk at Costco, we began using it on everything. Our favorite, and probably our signature food to family and friends, is popcorn popped in olive oil, topped with melted palm shortening and tajin. It's the best. I was reminiscing with a friend about the street corn and mango you'd get, always topped with tajin, which inspired me to actually google the recipe. I assumed it was lots of melted and butter and lots of spice, but everything I found actually called for mayo. It's essentially the same dip we make for our steamed artichoke hearts and it's close to perfection on corn. If you haven't tried tajin yet, this is my major push of encouragement- the stuff is awesome! 1. 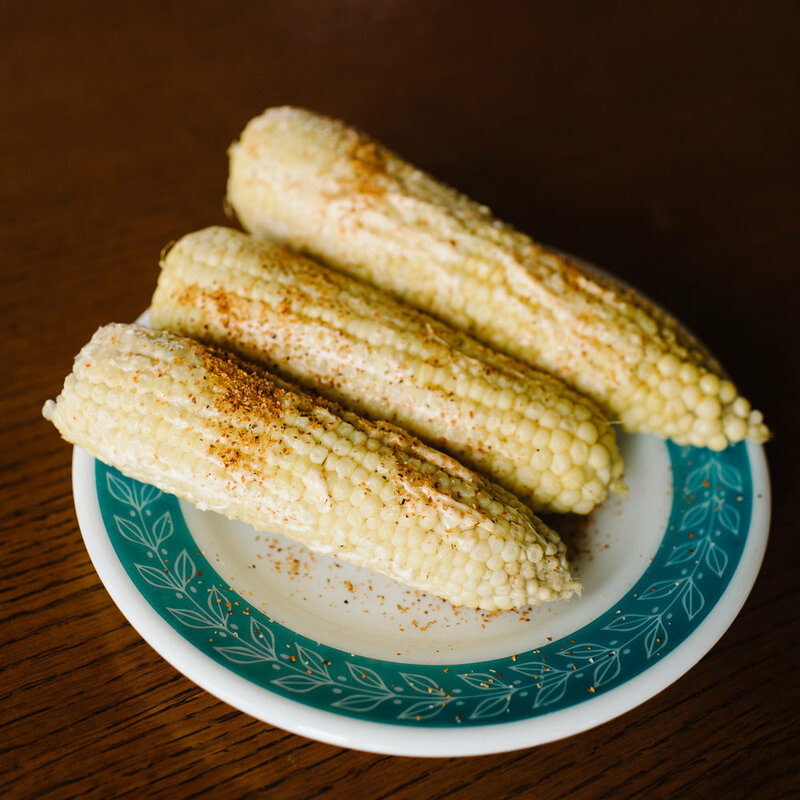 Cook corn however you like (grilled, baked, steamed, boiled). 2. Mix together mayo, garlic and tajin. 3. When corn is done, spread a thin layer of mayo around it, add more tajin if preferred.